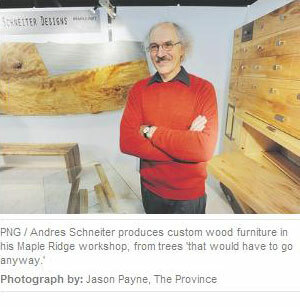 At Schneiter's Maple Ridge workshop, wood is carefully sorted in terms of size and type -- maple, pine, oak -- but also according to the tree it came from. That allows him to match the grain of the pieces for his furniture. "Look at this," he says, waving at a combination hutch and sewing desk destined for a seamstress in Europe. "See how the pattern matches exactly on those drawers there? I sacrificed an entire sheet of wood to do that." Schneiter, who was an exhibitor at the Interior Design Show West -- or IDSwest, uses traditional methods of joinery and marquetry to bring out the natural beauty of wood, eschewing nails unless they're absolutely necessary. He understands why people buy mass-produced furniture -- maybe it's all they can afford -- but says custom furniture is worth the price. In a corner is a piece with a twist on the traditional look of a dining table: the table top is French oak, and the 'legs' holding it up are glass. Tucked away in another corner are two sawn-off lengths of hazelnut tree trunk, burled in an unusual pattern. He's turned them into lamps. "I only take trees that would have to go anyway - maybe part of the tree is sick, or the lot is being developed. A lot of the developers around here call me before they cut anything down," Schneiter says. For more information, visit maplearts.ca.